Watsonia, a perennial plant growing from corms or bulbs. Watsonia produce erect spikes of showy flowers. These bulbs are very easy to grow and prefer full sun and cane be found for sale from autumn through winter at mail order nurseries listed or as potted plants at other times of the year. Pictured right is Watsonia ‘Wedding Bells’ a lovely pink flowering variety. 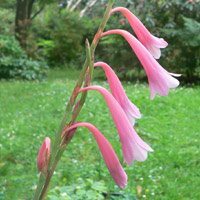 A native of South Africa, easy to grow, watsonia provide tall flower spikes during spring that are a feature in the garden border. With white through to red flowers they do make great cut flowers. These are drought tolerant and prefer full sun. Bulbs and Plants are TOUGH, they thrive on neglect, take care not to let them, take over. In some areas Watsonia can become an environmental weed. "Bulbs & Trains for the Garden"
Specialising in beautiful perennials & bulbs including new releases from Europe & USA. Many hardy, rare & difficult to find ‘drought hardy’ plants, quality vegetable & flower seeds. Retail & Mail Order Specialist Growers of Heritage Roses, Unusual Perennials, Tree & Herbaceous Peonies. Mail order and Nursery Sales. Guaranteed "garden worthy" bulbs, plants and perennials. Visit the website to browse our large range of daffodils or request the latest free catalogue.